Prototype: German Federal Railroad DB type Bm 234 compartment car. UIC-x standard design. 12 compartments, 2nd class. Ocean blue / beige paint scheme. The car looks as it did in the Mid-Eighties. Model: The entry doors have one-piece door windows. The entries have fold-up steps. The underbody is specific to the type of car. The trucks are Minden-Deutz heavy design (type 361) with disk brakes, without magnetic rail brakes, and with type G 150 axle generators at axle bearing R3. The 7319 current conducting couplings or the 72021 current conducting couplers, the 73406 pickup shoe, the 73400/73401 lighting kit (2 per car), and the 73407 marker light kit can be installed in the car. The minimum radius for operation is 360 mm / 14-3/16". A decal set is included. Length over the buffers 28.2 cm / 11-1/8". DC wheel set 4 x 700580. Entry doors with one-piece door windows. Minden-Deutz heavy design (type 361) trucks. 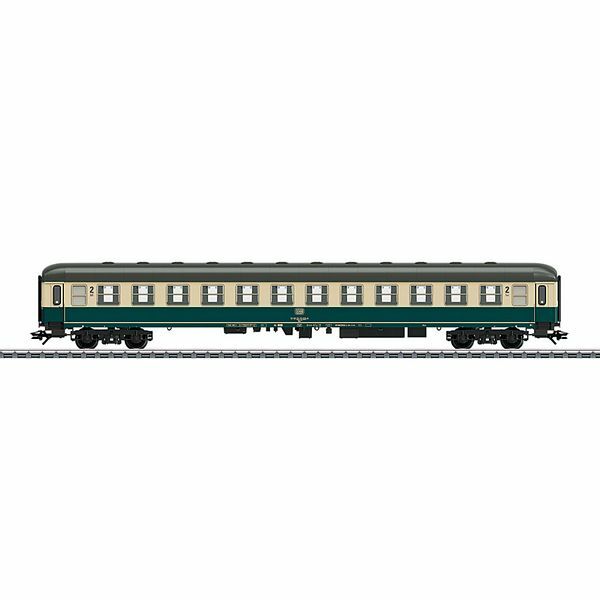 The electric locomotive to go with this car can be found in the Märklin H0 assortment under item number 37013. Prototype: German Federal Railroad (DB) type Bm 235 compartment car, 2nd class. Ocean blue / ivory paint scheme. The car has fold-up steps, rounded roof ends, and trucks with roll stablizers. Supplement to the InterCity 511 "van Beethoven" for the route Dortmund – Mannheim – Stuttgart – Munich. The car looks as it did in the summer of 1985.